I grew up in New Orleans. So I am a fan of eating crawfish. Over the weekend, my family had plans to visit New Orleans for a crawfish boil; however, my sister-in-law who lives in Houston got a new pool. 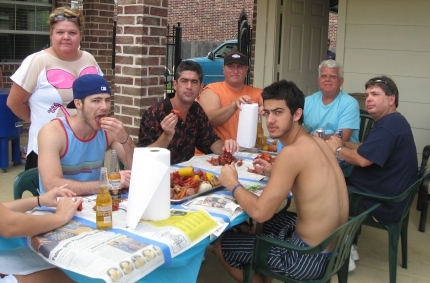 So we traveled to Houston, and my wife's brother-in-law, Ev, brought the crawfish boil from New Orleans to us. 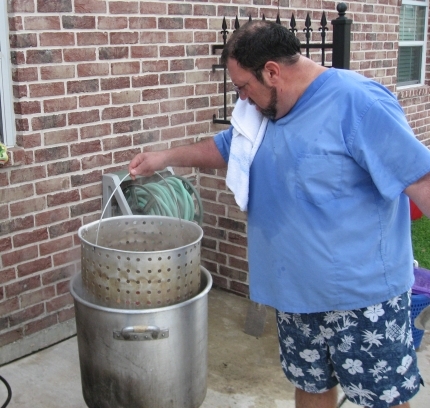 A crawfish boil is a serious undertaking. 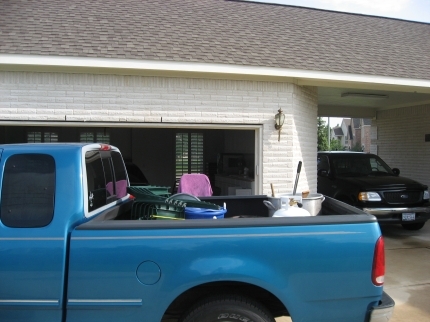 If you're going to have a New Orleans crawfish boil in Houston, you need a truck to haul the supplies. 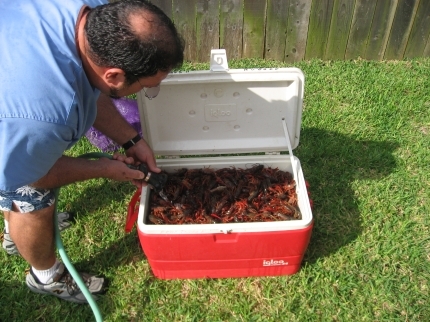 To transport the live crawfish, Ev put them on ice. You want them cool, so they are dormant; however if you freeze them, they will die. It's a fine art of how much ice to use. At the appointed time, it's time to open up the sack. 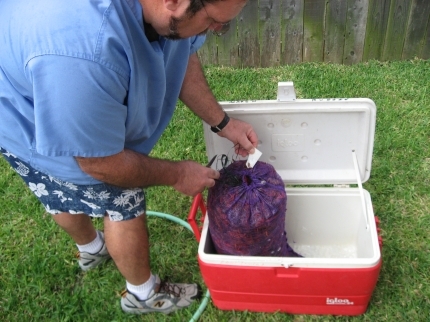 The 40 pounds of crawfish are poured into an ice chest. They immediately become very active. 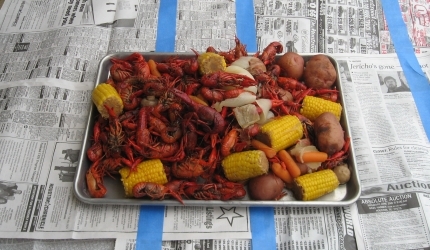 The crawfish look like miniature lobsters. 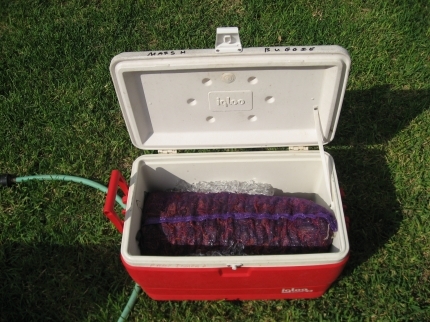 The ice chest is filled with water to allow the crawfish to rinse off and purge themselves. 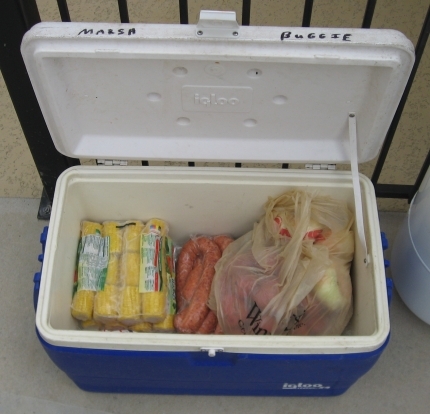 While the crawfish are rinsing off, the accompanying items are prepared by first removing them from the ice chest. These too had been transported. 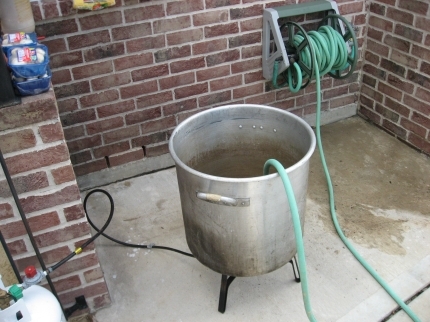 The first step is to boil a large pot of water. 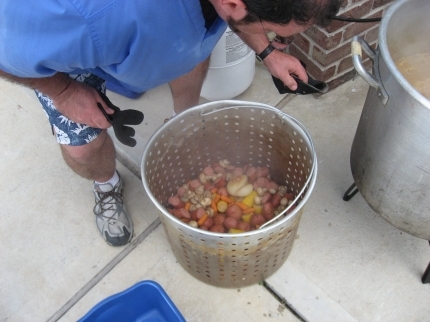 The pot sits on a burner connected to a propane tank. 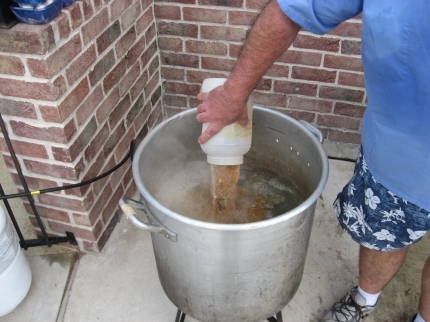 Once the water is boiling, the seasoning is added. This is Ev's own recipe which is a mix of salt, pepper, onion, and garlic. The seasoning is plentiful. 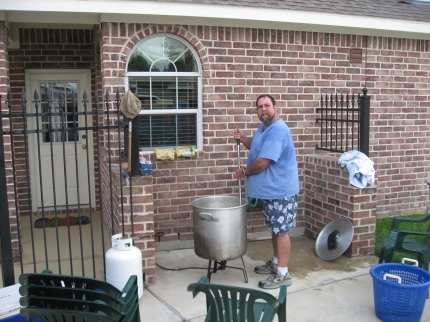 They say a watched pot never boils. In this case, Ev stirs as well as watches. The first batch of accompaniments is ready to be cooked. This includes sausage, onions, and potatoes. 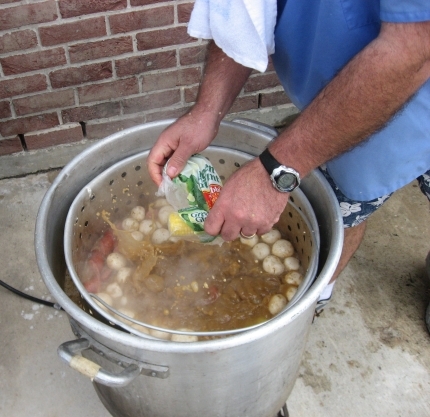 Ev adds them to the seasoned water, waits for the water to return to a boil, and allows them to cook for 12 minutes. 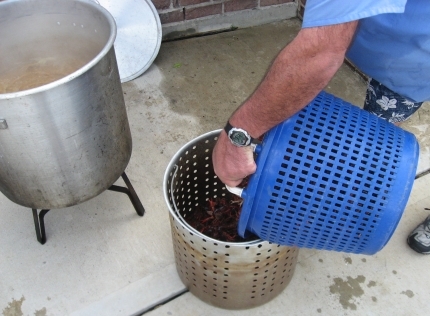 While that's cooking, the rinsed crawfish are transferred to a basket. 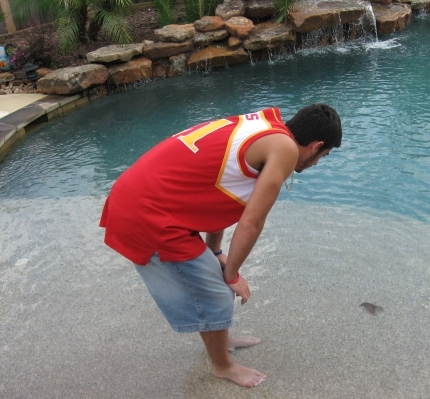 To entertain those not involved in the cooking process, we put one live crawfish in the pool. That's my son Steven. He is 16. We add corn, carrots, and mushrooms and allow everything to cook for another 3 minutes. We remove all of the cooked accompaniments and place them in a tub. 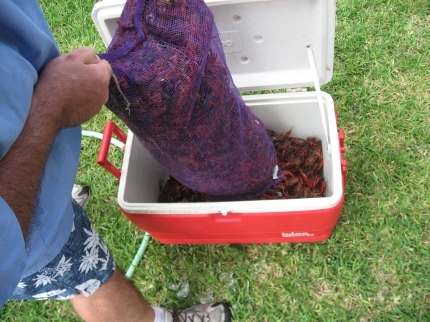 We transfer the crawfish from the basket to the cooking basket. 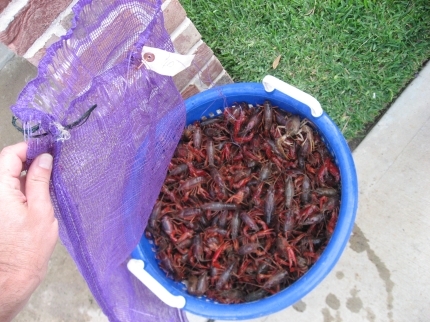 It is now time to cook the crawfish. 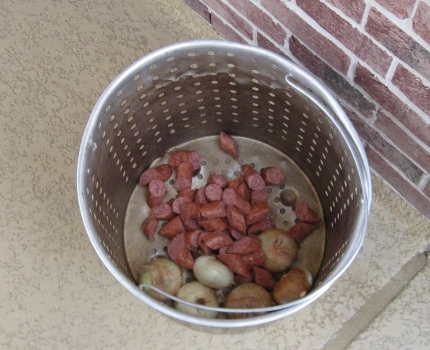 We pour the cooked accompaniments over the crawfish, return the pot to the boiling water, cover, and allow to cook. 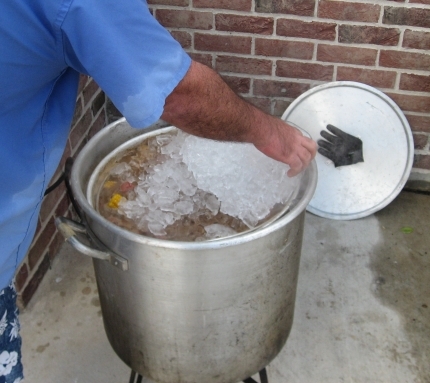 After 3 minutes, to avoid overcooking, we add ice to reduce the water temperature to warm. If you overcook, when you pinch the tails, instead of coming out as intact miniature lobster tails, they break. Now that Ev has done the hard part, others show up "to help." We then serve on a table covered with newspaper. Eating crawfish is a messy experience, but it's well worth it. We all sit down and enjoy. We are happy. 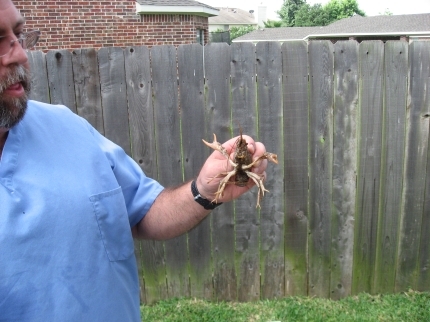 Like I said, eating crawfish is serious business. P.S. 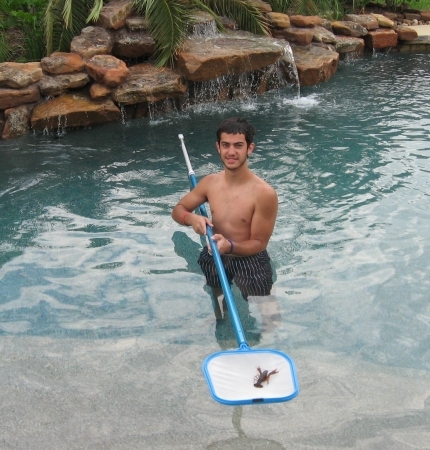 The crawfish in the pool was safely removed by my son. Crawfish chemistry is alive in the lab. I can't say the same for the crawfish themselves. They gave their lives for a good cause.